The first thing you should know is that when accessible bathroom design is done well, it will be a perfect blend between function, form, and aesthetics. Thanks to all of the advancements in universal bathroom design, contractors are able to transform and everyday space into and accessible sanctuary that is safe for everyone to use. Contractors combine products designed for patient safety with interior design ideas in order to create a bathroom that is functional regardless of age or ability. Take a look at how the licensed and insured Universal Design contractors at Glen Miller the Home Doctor can create a bathroom space that keeps you safe as you age in place without compromising on aesthetics. Wall hung cabinets are best as they can be hung at any height needed while minimizing obstruction of objects on the floor. Cabinets made from natural and easy to maintain materials are perfect for use in age in place bathroom remodeling. Wall hung cabinets give a contemporary feel with a minimalist approach that is perfect for use in Universal Design. Two very unique concepts but both providing function, safety, and beauty: walk-in tubs and threshold free showers are popular options in bathroom remodeling. Age in place showers have come a long way since the days of installing grab bars around an old ceramic tub. 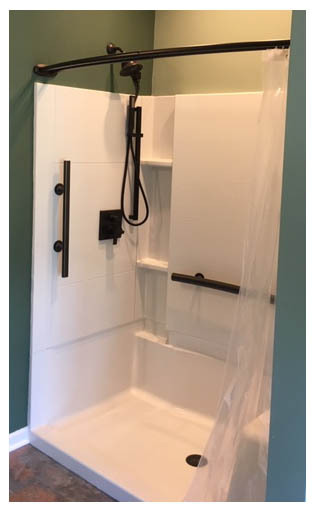 Accessible showers are now created using slip-resistant tiles, built in seating, built in grab bars, and removable shower heads. Thus, creating a luxury spa like shower that can be enjoyed without the worry of falls while getting clean. Accessible tubs make bathing possible without the dangers associated with limited mobility. Another important element in Universal Bathroom design is the accessibility to the toilet without the need for assistance. To accommodate aging bodies or ones with disabilities it is crucial to have a toilet that is easy to access. This means the height of the toilet is adjusted to be higher and grab bar support to help ease the up and down are in place. This also means installing toilet paper roles at a height and location that is accessible without any real reaching. Don’t skimp and install a raised toilet chair if you are redesigning a bathroom for Universal Design. Spend the little bit extra to install a secure, higher height toilet. It is usable for individuals of all abilities with very little noticeable difference to standard toilets. The whole concept of Universal Design is to create a space that blends functionality with home design; creating a space that is safe to use for individuals of all ages and abilities.